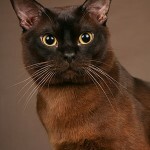 Burmese Cat is a domestic cat breed. It is not to be confused with the Birman Cat which is a quietly separate breed. The Burmese cat is a common pet found in Southeast Asia such as Malaysia, Myanmar (Burma) and Thailand. 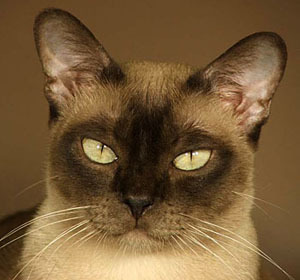 History indicates that the Burmese cat came from Thailand, then known as Siam. Based on 17 illustrated poems written in Siam during the period of the Siamese Kingdom, Ayutthaya, there were three breeds of cats mentioned: the Si-Sawat (Korat), the Thong Daeng (copper, known now as Burmese cat), and the Vichien Mat (Siamese). When Burma invaded Thailand in the 18th century, the Burmese soldiers brought the cats with them. In 1930, a female cat named Wong Mau was imported to the US from Asia by Dr. Joseph C. Thompson. She was bred with Tai Mau, a sealpoint Siamese from Thailand. The offspring was unique enough to be granted its own breed of Burmese in 1937 by the Cat Fancier’s Association. 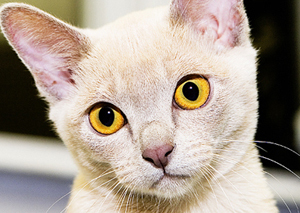 There are two types of Burmese cat breeds: an American and a British. The American type has four colors that are well known. These include champagne (honey), sable (brown), platinum and blue. The American Burmese are bred in two types: traditional and contemporary. The later breed has a rounded look. 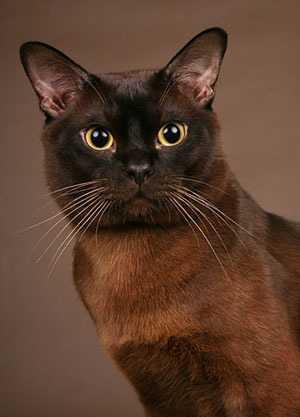 The British Burmese cat is brown (sable), blue, chocolate, lilac, red, cream and tortoiseshell. 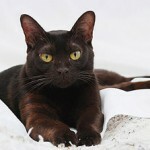 Due to a separate breeding program, Burmese cats have divided into British or European and American types. The British or European type is more Oriental in appearance, with a triangular face, small oval feet and a blunt muzzle, while the American type is stockier and rounder in the body, head, eyes and feet. It has markedly full cheeks and a short muzzle or “pug-like” face. The Burmese cat is strong, athletic and elegant. 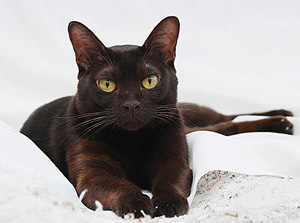 This cat is short haired and well known as a “brick wrapped in silk.” The breed has a fine, close, even and glossy coat that is satin-like in texture. The typical Burmese tail is of medium length, medium thickness at its base and tapering to a rounded tip. An adult male Burmese is large, while the adult female is more delicate and graceful. The difference in weight between males and females is about two or three pounds. The breed has large and expressive eyes that are slightly slanted. Their eye color is usually yellow and gold. The Burmese is a person-oriented cat and they love to be around you. They are very friendly and inquisitive, and outgoing, loving nature cats. They like to be near their owners, greet them at the door from work. The strong and loyal bond that forms between a Burmese cat and their owner is dog-like due to their devotion. Burmese cats are very affectionate and very social. They love humans and other felines as company. When you sit down, they will climb on your lap and start purring. They love to talk and will meow softly and sweet to their owner to get an attention. This type of breed is also known as a clown, with a complete repertoire of stunts – from tumbling and somersaults – to laying sprawled out on the sofa on the back with four paws in the air. Burmese cats are excellent hunters. They often return with a lizard, a small bird, mouse, or a rat – proudly presented as a gift to their owner. 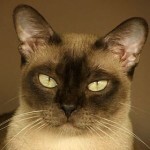 Despite the distinction between American and British/European Burmese cats, the lifespan of these beautiful felines is considerably longer than other breeds. They have been known to reach an age of between 16 years to 18 years. Their long lifespan is partly due to their size which ranges between nine to 13 pounds, making these Burmese cats a small to medium size. Burmese cats require little grooming. Due to their short fur, Burmese cats do not shed much. Burmese cats do not like to stay home alone for a long period of time because they are very social animals. If you are not able to entertain your Burmese cat, it is wise if you get similar breed of cat, or you can arrange your neighbor to visit. 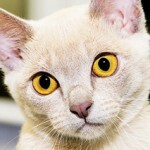 Your Burmese Cat will be happy to have another cat or a person around. Burmese cats have a very energetic lifestyle. They act very much like kittens, but as they grow older, this breed will slow down. They also sleep longer. It is very important to play with your Burmese cat no matter how old it is: playing with your cat makes the feline happy.